Sweater or jumper -- whatever you call it -- this fine merino wool V-neck sweater from Ben Sherman is the perfect weight for the in-between seasons. Perfect for Fridays or casual any day. Hip enough so colleagues will envy him, yet relaxed enough so his mates won't mock him. A perfect addition to the wardrobe all around. We also vote this one "Most Likely to be Stolen/Borrowed by Significant Other." 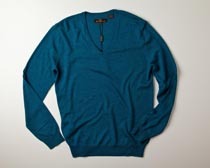 Shown here in petroleum blue but also available in brown.